Egg Foo Young 芙蓉蛋 is an authentic Cantonese egg cuisine. Since it looks like a western style omelet, those who are unfamiliar with it will mistakenly cook it the way of making an omelet. In fact, they are originated from two sides of the world and created in an entirely different way. 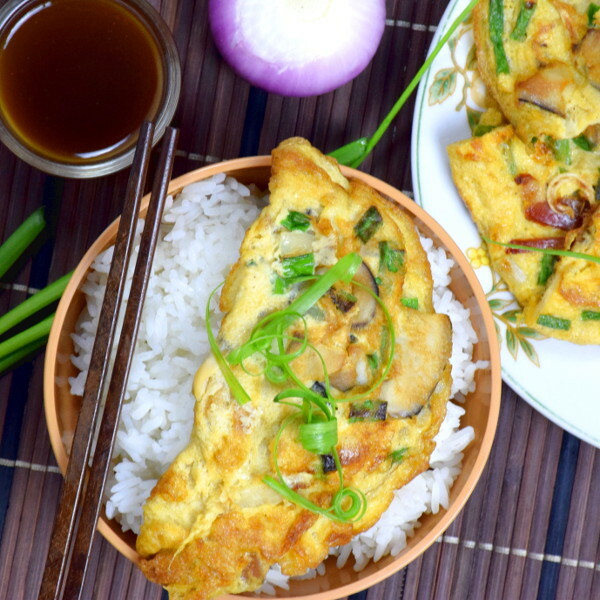 This article will highlight all the important aspects of making Egg Foo Young and provides an authentic Egg Foo Young recipe on how to prepare it at home. Legend has it Egg Foo Young was invented by the scholar 朱善祥 in the Ching Dynasty in the 18th century. One day, when he worked at the province of Yunnan, he was attracted by a local egg delicacy. The scholar loved to eat it so much and described the look of the egg dishes resemble the beautiful lotus flower (芙蓉). When he was back to Zhenjiang, he improvised the dish and eventually popularized in Guangdong. He called it as ‘lotus egg’ (Foo Young means lotus in Chinese), and the name got stuck with it until today. Nowadays Egg Foo Yong is considered a traditional Cantonese cuisine, with hundreds of variations created. The unique one is the American Chinese puffed omelet that serves along with brown gravy. This Cantonese hybrid dish is found in most of the Chinese restaurants in America. There are many different translations of the word 芙蓉蛋. Egg Foo Young, Egg Fu Yung, Egg Foo Yung are the common translations. What is the difference between Egg Foo Young and the western style omelet? 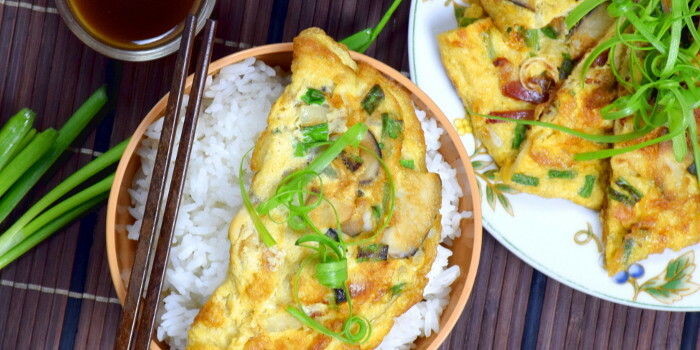 Before we pick up the recipe and start churning out Egg Foo Young for breakfast, make sure you understand the differences between this Chinese egg version and the western style omelet. 1. Egg Foo Young has a different set of ingredients in the egg mixture. The most apparent difference between Egg Foo Young and the western style omelet is the filling. Take a look at the following ingredients, and you will understand why it tastes so different from the omelet. The main protein can be barbecue pork (Cha Siu) or ham. 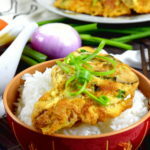 You can even use any leftover roasted meat to prepare chicken Egg Foo Young. 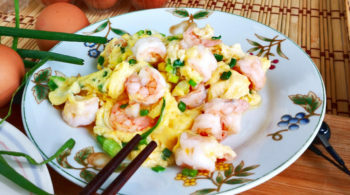 You can also substitute the meat with shrimps to make shrimp Egg Foo Young. Bean sprout is usually used to replace (or use together with) bamboo shoots for the crunchy textures. You will find ingredients like shitake mushrooms and scallion too. You will not find ingredients like tomatoes, capsicums, portobello mushrooms (the Chinese use shitake mushrooms). But onions and chives are traditionally included in the recipe. 2. Use only vegetable oil to prepare Egg Foo Young. The Chinese use vegetable oil (peanut oil, corn oil, palm oil) to cook Egg Foo Young. Butter and olive oil are rarely used. In my opinion, the choice of oil may not be as crucial as the other ingredients This is due to the culinary cultural differences between the west and the Chinese. Omelet is always cooked until the egg liquid is just set, or slightly brown on the surface. 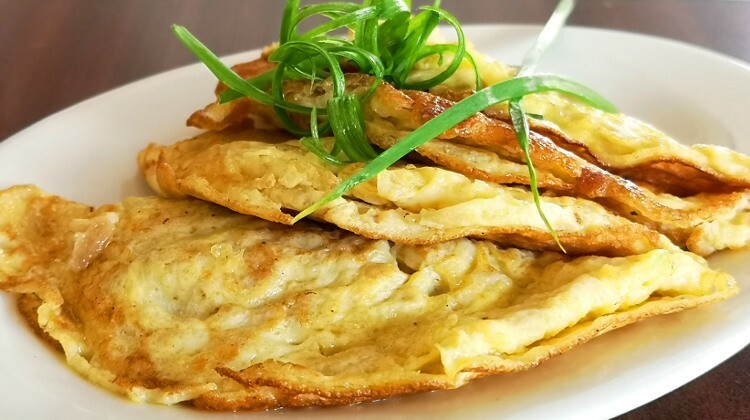 On the contrary, the surface of the Egg Foo Young is pan-fried until golden brown, which is considered overcooked by the standard of any other omelets. The egg becomes aromatic when it turns golden brown, and the inner part of the egg pancake is still soft and tender. 4. Use more oil to prepare Egg Foo Young. There is much more oil needed to make Egg Foo Young than an omelet. The reason? The eggs should be partially deep-fried in oil, which will cause the egg puff up and makes the texture very light. 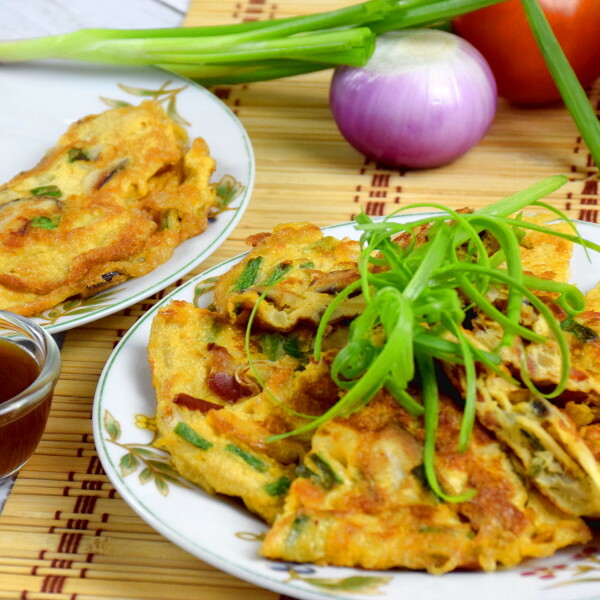 The puff-up state is one of the most significant differences between Egg Foo Yong and omelet. Purist of omelet may think this is a disastrous as you overcook it, and the healthy cooking proponent will frown and disapproved. However, we all know that any deep frying food like fish and chips will absorb more oil than Egg Foo Young with the delightfully fluffy, crispy sides and beautifully browned surface. 5. There is more than one way to prepare the egg mixture. Mix all the ingredients with the egg liquid and pour the required amount into the wok/pan. This method works best if all the chosen ingredients are vegetables and pre-cooked items such as ham. Cook half of the egg mixture until it starts to thicken. Return it to the bowl of the remaining uncooked mixture. Mix them well and pour back to the wok to cook until it turns golden brown. You can see how the Chinese chef uses this method in this video. This technique is interesting, the chef in the video did not explain the reason for doing this. I have tried it and do not see any major difference towards the end result. Stir-fry the meat and shrimps before adding to the whisked eggs. This technique is useful since the meat and shrimps require much longer cooking time to cook. Pour the whisked eggs (without the filling) into the wok. When the egg mixture is about to set, transfer the rest of the ingredient and lay on top of the egg. This method works best with ingredients that are more crunchy, which may sink and rupture the egg layer. I prefer the first method, which is simple and straightforward. Fill up the wok will the amount of oil that is more than required. Heat up the oil. Pour the excess oil back into the storage container. You will get a layer of glossy hot oil on the wok surface like painting a coat of shellac on your furniture, which prevents the egg from sticking on it. Pour the egg liquid into the wok with hot oil. Add a generous ladle of oil to the side of the wok. The edge of the egg pancake will start to bubble and immediately and puff up to form a beautiful halo of crispy tendrils. Keep your spatula off from the pancake. Let the eggs mixture cook undisturbed over medium to low heat until the bottom side turned golden brown. The making of Egg Foo Young is unquestionably different from omelet which is usually folded into a crescent. Flip over and do the same for the other side. Place it on a chopping board. Remove the excess oil with a kitchen towel before serving. 7. Serve the Egg Foo Young with (or without) the brown gravy. We do not serve Egg Foo Young with the brown gravy in China and South-East Asia. However, some people prefer to drizzle some light soy sauce on it before serving. On the other hand, the American Chinese version comes with Egg Foo Young gravy. The gray is made with soy sauce, chicken stock and thicken with cornstarch. I prefer the original version since it is tasty enough without the need of the gravy. Drizzle some brown gravy on the egg before serving if you are inclined to the American palate. Get the brown gravy recipe below to switch it up the humble egg to a grander presentation. A picture worth a thousand words, a video worth a thousand images. Egg Foo Young 芙蓉蛋 is an authentic Cantonese egg cuisine. Crack 6 eggs into a large bowl. Clean barbeque pork into thin slices. Blanch the bamboo shoot in hot water for half a minute. Remove and cut it into thin slices. Add the barbeque pork, chopped onions, slices of mushrooms, bamboo shoot, bean sprouts, salt, light soy sauce, sesame oil and cornstarch into the whisked eggs. Mix well. Heat up some vegetable oil in the wok. When it starts to become smoky. Remove the excess oil from the wok. The wok is now coated with a ten layer of hot oil. While the wok is still hot, pour the egg mixture into the center. The edge of the egg will immediately bubble and puff up. Once the edge is puffed up, reduce the heat to medium or low and like it undisturbed until the bottom is set. You can swirl the egg around in the wok. Cook bottom side of the egg pancake until golden brown. Tuen the egg over and cook the other side. When it tun aromatic and golden brown, remove and place it on a chopping board. Cut the egg into wedges (much like pizza). Dish out and serve. If you prefer to serve it with the sauce, just put all the ingredients in B in a pot, bring it to a boil. My mother used a different set of ingredients for the egg omelet. As a Cantonese, her recipe is more straightforward. There is no bean sprouts and bamboo shoots in it. The egg liquid is mixed with minced meat, sweet pickles 菜蒲, scallions and seasoned with salt and white pepper. Try my family recipe for a change if you think the ingredients in the egg foo young sounds ‘weird.’ The disapproval is entirely understandable for people who live in the Southern part of China who do not used to such ingredients. 1. Marinate 75g of minced meat with a quarter teaspoon of salt, a teaspoon of light soy sauce and some oil. Stir -fry the minced meat until it is cooked. (Note: you can also substitute the Char Siu to make a chicken egg foo young). 2. Combine the minced meat with four eggs, a dash of white pepper, two tablespoons of chopped scallions, two tablespoons of sweet pickles. 3. Add some oil to the wok. Divide the egg liquid into four portions. Add one portion to the wok and pan-fried the omelet just like making the egg foo young. Repeat the same process to make a total of four small omelets. Serve with steamed rice. 8 replies to "How to make the wonderful Egg Foo Young (Seven important tips)"
Wonderful video’s, love your patient explanation throughout the process of creating the egg foo young! Would love your opinion as to what brand of work that you recommend? I love the type of work that can actually add some char bbl kind of flavor to the dishes prepared. My Calphalon wok $99 does not do that for me :(. Is there a website you would recommend that I can peruse? Thank you for your comment and sorry for the late reply due to the Chinese New Year break. The best wok that can generate the wok-hei (the aroma you are familiar with at the Chinese restaurant) is cast iron wok. It doesn’t means the higher the price the better it is. The non-stick type is not as good as cast iron because it can handle very high heat. Wonderful and so interesting to read! I want authentic recipes, and only use recipes by the natives. After seeing your tips and watching the video, I am ready to make my FIRST Egg Fu Yun! Thank you for trying the recipe. I referred to some recipes written in the native language when I wrote the egg foo yong recipe. Hopefully, it is authentic.